Fully waterproof 3-layer fabric, rolltop closure and an all welded construction: It is 100% water, mud, snow and dust proof. Made from Enduristan's new 3-layer fabric, a supreme high-tech material. The outer layer of extremely abrasion resistant polymer protects your belongings whilst the inner layer is made of high visibility red vinyl. In between a 1000D Nylon mesh is embedded. The mesh is densely woven yet flexible to allow the 1000D Nylon filaments to align in the direction of the stress for maximum tear resistance. WEAR PROTECTION: The outermost layer of the 3-layer fabric is made up of heavy duty polymer which acts as superior wear protection. With an all-welded design it makes the Monsoon 3 even tougher. TEAR PROTECTION: The middle layer consists of 1000D Nylon mesh which is densely woven yet flexible to allow the 1000D Nylon filaments to align in the direction of the stress. WATER PROTECTION: The innermost layer of the 3-layer fabric is made out of red vinyl for perfect visibility and 100% waterproofness. 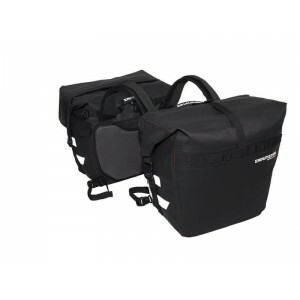 Unlike hard panniers, the roll top closure does not permanently bend in the case of a crash, keeping your items fully waterproofed. IMPACT PROTECTION: At the front, underneath and at the rear we have added a high impact plastic to protect the contents of your bags from loose gravel and surprise branches. Monsoon 3 fits many bikes without frame, thus keeping the bike narrow and the weight close to the centre. Always take care to keep a safe distance to hot parts of the exhaust system and keep Monsoon 3 well out of hot exhaust gases. We suggest using one or more of our Inferno Heat Shields.